Wilson & Hampton established in 1923 has experience with almost every size and type of building using every field applied coating. Our collective knowledge, expertise and industry resources can provide a high performance solution meeting your time line and budget. When you select Wilson & Hampton Painting Contractors, you can be assured that your projects will be completed by craftsmen who are accomplished union labor, trained to use the most efficient access and application equipment get the job done. No longer do you have to have a WHITE dry erase board. You can now have it clear or colors for any surface. You can coat any chalkboard with clear and turn it into a dry erase board. You want to convert a wall to dry erase board, coat it in clear or change the color of the wall. If you want it to match your filing cabinets and cubicles we can coat your wall with metallic colors. It is now your choice for your décor. Our Professional Commercial Painting & Wallcovering services are available throughout Southern California in Los Angeles, Orange County and San Diego County. It is our mission to make your business attractive to your customers and employees. Our goal is to create a long term relationship with you and to maintain each relationship with excellent service. Our professional painting work crews go the extra mile to ensure the successful completion of your project with minimal disruptions to your business day. We can help you to keep your business running as usual by completing your projects in the evenings, overnight or on the weekend. We understand the impact of having your property or facility painted. We respect your time and will see to it that your job runs smoothly. All painting work is covered by our comprehensive one year warranty. Our products are covered by up to a 10 year warranty. We also can provide extended warranties with certain products. 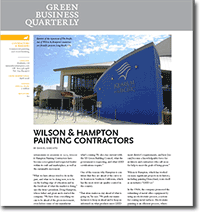 Contact Wilson & Hampton Painting & Wallcovering Contractors if you have any questions. The Professional Painting Contractor with decades of experience with the application of specialized coatings designed for manufacturing and processing facilities. We understand the critical need to prepare and protect surfaces before the application of those coatings. All of our work is done with the strictest safety precautions taken at ALL times for our team and yours. Wilson & Hampton is a certified applicator of Fire Resistant Coatings for steel and wood. We have special expertise in the application of various floor coatings: sealers, epoxies, and resinous mortars and anti-microbial coatings used in hospitals, clean rooms and food facilities. Meets ADA Requirements. Please read our Flooring Guide, coauthored by Mr. Doug Hampton. Resurface your ceiling instead of replacing it! 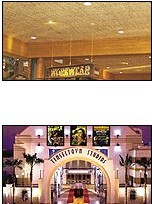 Restore and refurbish your ceiling tiles for about 1/2 the cost of replacing them! We can apply a specialty coating to your tiles with no mess and provide better acoustics than the original. The coating is a Class A fire retardant, whiter than new tiles, non-bridging and maintains acoustic properties. Also supports the Green movement by not throwing all your ceiling tiles into a landfill. Call us for more information. Dry Erase Coatings can turn your existing acrylic latex painted walls into a writable and erasable surface. With a clear coat you do not have to sacrificing the existing color scheme. Apply to the walls in your office, meeting rooms, laboratory or school.